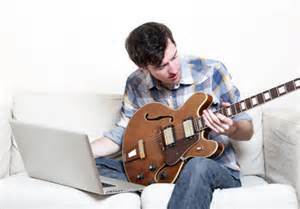 If you are looking for free online guitar lessons for beginners you have come to the right place. Hey, it’s Darrin Goodman from GuitarControl.com and I want to share with you some of the great free online guitar lessons for beginners available at GuitarControl.com as well as there YouTube channel. Let’s look at some lessons from GuitarControl.com founder Claude Johnson. In this lesson Claude goes over some basic music theory to help you understand chord progressions. In this lesson, Claude teaches what he says are the seven must know basic chords so you can play your favorite songs. In this lesson, instructor Jon MacLennan demonstrates how to use a capo. Here is another one from Jon on basic strumming. Now that you have learned about basic chords and chord progressions and how to strum and use a capo, it’s time to try some songs. GuitarControl.com has many lessons on some great beginner songs. Here are some easy song lessons from instructor Paige Zellars. Next we have song instructor, Beth with some more easy songs. This is just a few of the many great song lessons available at GuitarControl.com and there YouTube channel. All of these great free guitar lessons come with free guitar tabs and chord charts to go along with the video.